If you’ve ever owned a car, then you’ve probably spent money repairing it. My cars always seem to break down at the most inopportune moments. I remember the first time I had to change a tire on my car. I was coming home from class one night and it was pouring down rain. It was not fun to say the least, but it was an easy fix. Many cars today can last at least 200,000 miles if you treat them properly. 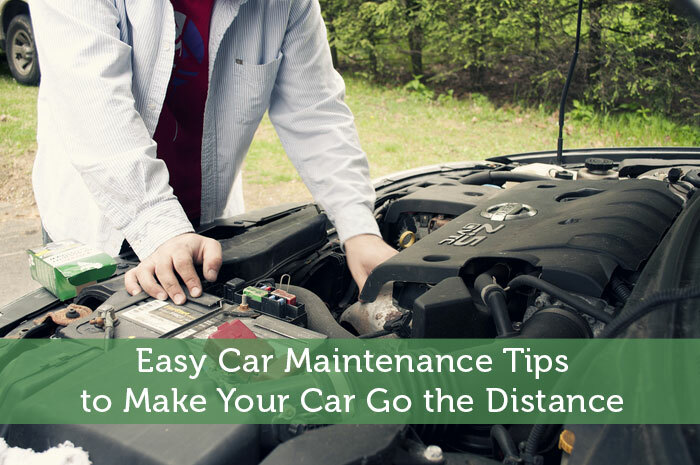 By implementing some easy car maintenance tips, you can help further the life of your car and save yourself thousands of dollars in future car repairs. I don’t pretend to be a car expert by any means, or know how to repair many things on my car but I do know that there are simple things you can do to maintain your car. There are numerous things that you can do to your car and not have to worry about a steep mechanic’s bill. By doing your own oil changes, changing spark plugs, or changing the battery you can help further the life of your car and keep the cost down. As a frugal person, I love to try and do things myself but if that’s not an option for you then my best suggestion is to find a good reputable mechanic. My wife and I have been going to the same mechanic for ten years, and he’s worth his weight in gold. I know that I can take our car to him and will get the honest truth. He often times will inform us of some easy car maintenance tips so that we don’t have to bother him with something simple. Your glove box is loaded with car maintenance tips. Many cars come with manuals that have maintenance tips specific to the car and even have a maintenance schedule to follow. The manual will commonly have multiple maintenance schedules provided. For most individuals, the extreme-use maintenance schedule is what you’ll want to use. That is for most people who do a lot of stop and go city driving, live in harsh weather climates, or live in a mountainous region. Find your maintenance schedule and come to know it; your car will thank you! If you bought your car through a private party, or didn’t get a manual when you bought the car, contact the dealer, or go to Edmunds.com as they provide maintenance schedules for many cars and a pricing estimate for your area. If you’re like me then you plan on having your car for many years. Trying to be frugal, I look for car maintenance tips that can help further the life of my car. One of the easiest ways to further the car’s life is to simply care for it. Wash and wax it regularly, check the fluids regularly and check the tire pressure once a month. If you hear something funny while driving or detect a strange smell, then it’s possible that something is amiss. Check out the problem right away because if you catch it early enough, you can usually reduce your repair costs and prolong the life of your vehicle. Be frugal about what you spend on car repairs, but don’t be cheap as poorly-made replacement parts could just land you in the same problem again. Finally, don’t fall for mechanics who recommend things that jack up the cost of your bill and appear nowhere in your maintenance schedule. What car maintenance tips do you have or follow? Do you maintain your own car, or do you go to a mechanic? Author Bio: John is the founder of Frugal Rules, a finance blog that regularly discusses investing, budgeting, and frugal living. John is a father, husband, and veteran of the financial services industry who’s passionate about helping people find freedom through frugality. I don’t mind paying for oil changes. I never pay more than $20 and it isn’t worth my time to mess with it. Plus, I don’t have the tools to make it easy. Thanks Mr. CBB! Sounds like we do many of the same things on cars. There are many simple ways to DIY that can really help the life of your car. Great point as well on swapping services! The only time in the 8 years I had my Camry that it ever saw a mechanic is when the radiator started leaking and I was living at an apartment where I couldn’t work on it myself. Okay, there was also the time my alternator died 100 miles from home. But all routine maintenance and the vast majority of all the repairs done during the 140k miles I owned the car were done by me. That’s awesome you do most of your own work Edward! If you know what you’re doing it can really save a good chunk of money, plus you get the satisfaction of doing it yourself. I had very good intentions of actually doing some car maintenance myself – I even bought a dummies guide. Alas, the guide pretty much just sits there..
I’ve done similar things with other issues as well Cat. 🙂 I do what I can and then leave the rest to the experts. We maintain our cars. However, it is nice that the boy now works at a car dealership. We can get all parts and services for super cheap! That’s awesome Michelle! We have several friends that work at dealerships that get to do the same thing. I am going to try to drive our cars until the wheels fall off! So it’s very important to keep up with our maintenance so we don’t have to spend the money on replacing them. Good post. Thanks! We’re pretty much the same way Holly. Cars cost so much and by giving them a little care you can really help them last for years. I typically have someone who knows what they’re doing take care of my car 🙂 In fact, next weekend is another service trip to the dealer. I tend to be the same way Veronica, especially for anything major. It can be a huge help when you have someone you can trust. Thanks Jason! I’d prefer to do it myself as well, but it just is not worth the time and effort for me. I hate spending the money myself, but when you have a good mechanic you can trust, then I know it’s making the car last longer. Great tips! I adhere to the maintenance guidelines like my car’s life depends on it. I’m not to handy messing around under the hood so usually take it in to the shop. I’ve done my own spark plugs and starter though. The trade out of time and cost normally isn’t worth it for me though so I use a trusted mechanic. Thanks John! We follow the manual to the letter as well as it really does help prolong it’s life. I’d much rather save my time for something else though and use our mechanic. I have changed oil, tires, filters, brake pads and other few things on my car and motorcycle. I strictly follow the maintenance schedule, even though my perishables still look good, to avoid being stuck in the middle of nowhere with a broken car. The little extra money is worth it because breakdown is so expensive. Wow, you’ve done much more than I have on my car Pauline! 🙂 I am sure being able to do things like that has proven to be very helpful at times. Nice article John. I have been doing my own car maintenance for about 10 years. I am kind of car enthusiast, so it comes easy for me. This has not only saved me a lot of money over time, but made me more comfortable fixing more complex issues. I think most people don’t maintain their vehicles themselves due to the fact that they either fear messing something up or “don’t have time”. I can usually have my car repaired faster than taking it to a shop. Thanks Grayson. That’s great you’re able to do your own mechanic work. I believe I could do it, but would much rather pay an expert to handle it as it would take me too much time to manage it myself. If you’re able to do it yourself & save time then that’s the way to go in my book. Thanks Jacob! That’s awesome you’ve been able to do so much yourself. I know that really can save a lot of money over time. While I am confident I could teach myself, I’d much rather leave it in the experts hands. I really enjoy finding ways to be frugal and I have worked on my own cars in the past so thank you! I know nothing about cars and really need to wash mine more, but when the kiddo mucks up the interior, it’s hard to care too much. I do know how to get unstuck from most snow and ice situations, does that count? I go with you. Car maintenance is essential so your car will last longer. In fact, I do some small repairs myself to save on money. I take good care of my car and go the mechanic for more complicated issues. I agree David, proper maintenance can really help your car last. I do what I can, but trust my mechanic with a lot of it. Since we bought a new vehicle a few years ago we’ve been maintaining it, it has to last us! Hubby does what he can but given that the car is still under warranty there’s certain things we have to have pros do or we can nullify it. I hear you Catherine. One of our cars just finished being under warranty and it was nice to have everything taken care of for it. Finding a good honest mechanic is a luxury these days. I’m still in search of one in my area, which causes me to bring my vehicle to someone I’m not sure I trust. So far so good, but I’m crossing my fingers. I totally agree Jason! We’re so thankful for our mechanic and would trust him with anything on our car. That’s our goal on our newest car…300k. We were just talking the other night ho awesome it would be to give it to our five year old daughter when she’s ready to drive. I had a really bad incident after my father showed me how to change the breaks. I bleed the air out and was supposed to back the car out slowly. There was still air in the breaks when I backed out the car, it didn’t stop then my foot slid to the gas. Long story short, I don’t like to work on cars. Luckily my friend pointed me towards a good cheap honest mechanic. Wow, yea, I can understand after that how you’d hand over mechanic’s work to someone else. I am sure I’d do much worse so I have no problem paying our mechanic to do what he does best. Good post. Checking for car problems as early as possible might surely help you save a lot in car maintenance expenses. Thanks for the post. Again, something everyone can do. The coolant is the other thing your engine cannot go without. Every engine is different but if you check your handbook you should find where the coolant reservoir is. It will normally be bolted to one side of the engine bay or the other, and be a white semi-transparent bottle. Wait until your engine is cool and take a look at it – the outside should have ‘low’ and ‘high’ markings on it and the level of coolant inside should be between the two.Do not take the radiator cap off to check coolant levels. If the coolant system is still hot then it is still under pressure and the pressure release will burn you. Thanks for the detailed tip! Regular vehicle maintenance will not only ensure maximum car performance but will also prevent costly repairs. Sometimes, even the smallest defect that seems irrelevant to you may lead to a major problem which will consequently increase your car maintenance costs. This is true; if we service our cars regularly, we can make it able to go for a long way. For this, one must take their car to the mechanic who is professional and experienced. You are right a car that undergoes servicing on a regular basis has long life and if owner is not familiar about how to accomplish it then he must take it to a proficient mechanic.